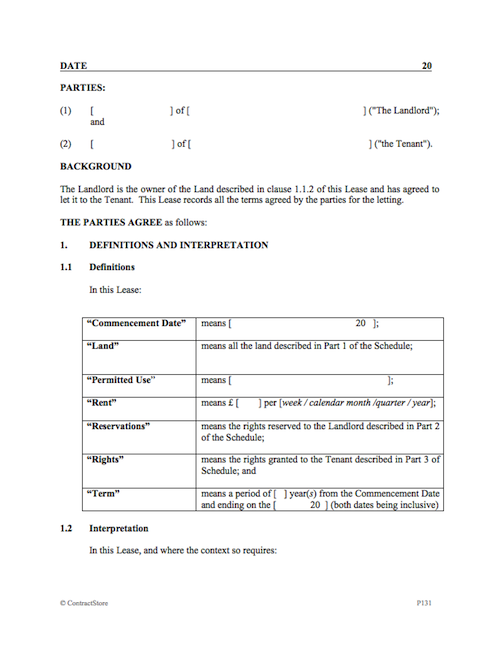 This legal document template is a Lease of Land, for the letting of land for a period of 7 years or less. It is suitable for the letting of garden ground to a neighbour for growing vegetables or keeping chickens, for example. It is not intended for use in cases where the Tenant is carrying on a business or for agriculture. A Schedule details the land, rights included, rights reserved, tenant’s obligations and landlord’s obligations. 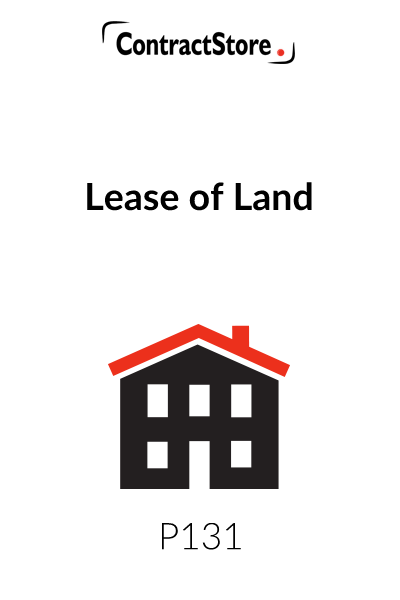 This Lease is intended to be a simple and straightforward way of granting a letting over land for a period of 7 years or less. It is not intended for use in cases where the Tenant is carrying on a business or for agriculture. 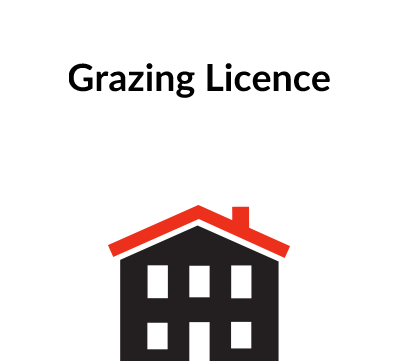 The Lease may be suitable for the letting of garden ground to a neighbour for growing vegetables or keeping chickens, for example. There is a Schedule setting out more details including obligations for the Tenant in Part 4. The Lease may require some modification to suit the particular circumstances which apply. The full names of the Landlord and the Tenant should be given at the beginning. The definitions should be completed where there are blanks. The “Commencement Date” is the date when the term of the Lease is to begin, though this may be later than the date of the Lease. The “Land” should be described in Part 1 of the Schedule. It may be best to refer to a plan as well so that the extent of the Land is clear and, if so, then a copy of the plan should be attached to the Lease. “Permitted Use” should have a narrow and precise definition, such as “use as a private garden”. The “Rent” can be expressed in various ways. It can be an annual sum provided, of course, that the Lease is to be for a period of at least one year, and then clause 3.1 provides that it is to be paid by instalments. The instalments may be weekly, monthly or quarterly (the usual quarter days being 25 March, 24 June, 29 September and 25 December). Alternatively, the Rent can be expressed as a weekly, monthly or quarterly sum, and clause 3 can be completed accordingly. It is likely that the first payment of the Rent will be for part of the first period and so the amount payable for this first period up to the first rent day should be calculated on a daily figure and then the total amount payable can be inserted in clause 3.1. The “Reservations” are the rights which the Landlord may want to reserve and these are set out in Part 2 of the Schedule. They may vary depending on whether the Landlord owns adjoining land. The “Rights” are the rights which will go with the Lease. 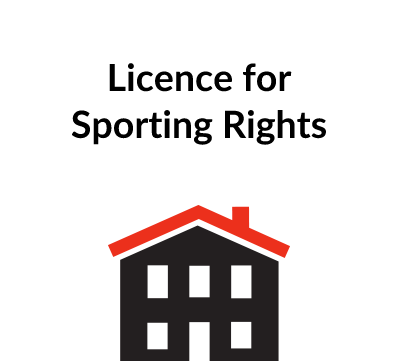 They will be rights which the Landlord will be in legal position to grant, such as rights over a lane owned by the Landlord for access, or for rights over adjoining land owned by the Landlord for a water pipe. If the Landlord does not own any adjoining land, then references to “Rights” should be deleted including Part 3 of the Schedule as none can be granted legally. Any existing rights over adjoining land not owned by the Landlord but which are enjoyed with Land will be included with the Lease automatically. The “Term” should be for seven years or less so that it will not have to be registered at the Land Registry. It may necessary to delete clauses 2.2 and/or 2.3 along with the respective Parts of the Schedule for the reasons given above under clause 1. Clause 3.1 has two possibilities, but may require further change. The clause includes payment of value added tax, if the Landlord is obliged to charge this. These are set out in Part 4 of the Schedule. The basic obligations have been included, but others may be included depending on the nature of the Land. The Tenant is prohibited from using the Land for any business. This will ensure that the letting is not regulated by the legislation relating to business tenancies. There is also a restriction against using the Land for agriculture to avoid the relevant legislation. In both cases, the legislation provides for special notices and rent control and, in the case of a business tenancy, the right for the Tenant to apply for a new Lease. The Landlord will probably want to avoid all this. If the Landlord is in receipt of grants or other agricultural payments, then further obligations may be required to ensure that the Tenant does not prejudice the payments. Paragraph 8 has been included as the Landlord may not want others taking over as tenant. In return, the Tenant has the option of ending the Lease early under clause 9. The position about insurance may need to be checked and it may be necessary to include paragraph 10. Obligations have been included to deal with buildings on the Land as there may be a shed or outbuildings. It is unlikely that any more obligations will be required beyond those set out unless special circumstances require this. Clause 6 is standard and applies if the Tenant becomes insolvent and unable to pay the rent. Clause 8. If the Tenant owes any rent, the Landlord will be free to issue court proceedings to claim the arrears or to arrange for a bailiff to try to collect them, as arbitration will not apply. If you do not want to include arbitration as a means of resolving any disputes, then the whole of clause 8 should be deleted and the subsequent clauses renumbered. Any dispute will then have to go ultimately to court. Clause 9 contains an option permitting the Tenant to end the Lease before the Term expires. This option has been included as paragraph 8 in Part 4 of the Schedule prohibits any transfer of the Lease, and so the Tenant may want to give notice under clause 9 in a case when the Tenant does not want to continue with the letting and would transfer the Lease but for the prohibition. The Lease should be executed by the parties and dated at the top of the first page as soon as they have finalised all the terms. The Commencement Date can be the same day as the date of the Lease or later. Completing and dating the Lease in advance of the Commencement Date will ensure that both parties are committed to the arrangement, and this has the benefit of certainty for both. The first payment of the Rent should be made when completion takes place even if this is before the Commencement Date. The Lease should be executed by the Landlord. The counterpart (being an exact copy of the Lease) should be executed by the Tenant. Following completion the Tenant keeps the Lease and the Landlord has the counterpart. That's excellent, thank you. This is the kind of assistance it looks like your competitors just don't do.